Children’s World Impact thanks FORM Wealth for their sponsorship of the annual golf tournament held August 15, 2016, in Lake Geneva, WI. FORM Wealth served as the event sponsor, with a $10,000 donation and the entire office staff volunteering as facilitators of the event. The 2016 golf outing raised $40,000 which is being used to build a school building in Desarmes, Haiti. 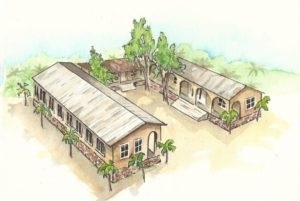 This will be CWI’s third school, with two in Haiti and one in connection with the widows’ project in Ghana, Africa. CWI is working with Schools4Haiti, another 501(c)(3) organization. Schools4Haiti has 4 different locations in the central plateau of Haiti, where they support children. Each of these locations operates a school, supplying a free education to almost 1,000 children and employing principals, teachers, and other various staff who run the schools. In addition, two of the locations house orphans. While there is a school at each location, students meet in makeshift structures at two of the locations. The school building in the city of Desarmes is currently a metal roof that is held up by wooden posts with tattered tarps for walls. 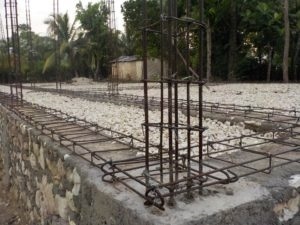 The Haitian who began this school, Pastor Arnold Saint Louis, has had the dream of building a permanent structure for quite some time. Land has been purchased and a plan has been developed. Children’s World Impact is excited to be making this dream a reality. Construction began in August of 2016, with the first of the two wings. Footings were dug, rebar installed, and sand and rocks were delivered for the forming of the foundation. Haitian craftsmen carefully choose and place rocks that are cemented in place, forming the foundation of this wing. The completed school will have two wings, with 4 classrooms in each of the wings. In addition, there will be a small administrative building with room for storage. An open courtyard will connect the two wings. The cost of this structure is close to $80,000. While Children’s World Impact will be financing the construction, all work will be done by Haitian workers and the school will continue to be run by Pastor Arnold. Schools4Haiti will continue to cover all operating costs. FORM Wealth is an independent practice. Securities offered through Raymond James Financial Services, Inc., member FINRA/SIPC. Tyson Ray, CFP® and Luke Kuchenberg, CFP® are the founding partners of FORM Wealth. Their office is located at 431 Geneva National Ave S, Lake Geneva, WI. Contact FORM Wealth at 844.600.3008 for more information.